About Us Potash Nursery Ltd are completely dedicated to your total satisfaction. If you have any suggestions or comments please email us using the link on the store page. Delivery Schedule Dispatch begins from early March each Spring (weather permitting). Orders can be placed at any time in advance with a specified week for delivery (which will be adhered to as closely as possible, but is not to be regarded as a critical element of the contract), please allow a minimum of 30 days for our team to process your order. If no week is specified then the plants will be sent during April (the middle of our dispatch season). Orders will only be accepted up to 31 May as after this time we do not have plants on the nursery small enough for mail order. 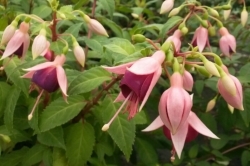 Guarantee We only send out well established young plants of excellent quality, exactly the same stock as we use ourselves for growing on at the nursery. We are therefore happy to guarantee our plants for 14 days from the date of dispatch. If you are not completely happy with the plants please return them to us in their original packaging and we will provide either replacement or refund at our discretion. Returns & Cancellation Policy You are entitled to cancel your order from the day of ordering until the date of dispatch, however, because of the nature of the goods, once we have disptached your plants, under section 13, paragraph 1c of the Consumer Protection (Distance Selling) regulation 2000, goods that are liable to deteriorate or expire rapidly means your statutory 7 working days cooling off period is void.